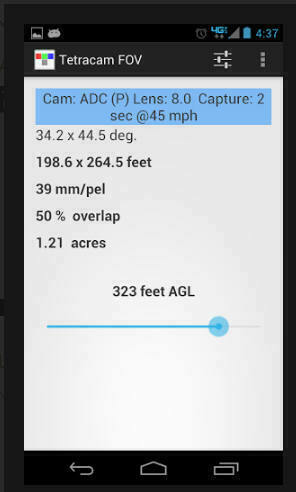 APP Description: Tetracam FOV is a simple tool to help you determine the altitude to fly at (AGL) to capture the image area, overlap and ground resolution you need. Select your camera type, orientation and lens focal length on the settings dialog. You can also set the maximum value for the altitude slider, the units you want to see results in, feet or meters, the capture interval and the aircraft groundspeed. Setting those last two allows the image overlap calculation. Adjust the altitude slider until the area in view, ground resolution or overlap match your requirements. The display shows the lens acceptance angles, the x and y dimensions of the area in view, the ground resolution, percentage of overlap and actual area in view, in acres or hectares.